I have been eating fried Zucchini since I was knee high to a grasshopper. Don’t laugh. ‘Tis true! Many of my Dad’s zucchini sort of grew out of control and Mom would slice up some of those big bad boys,dip them in flour and fry them up in oil. 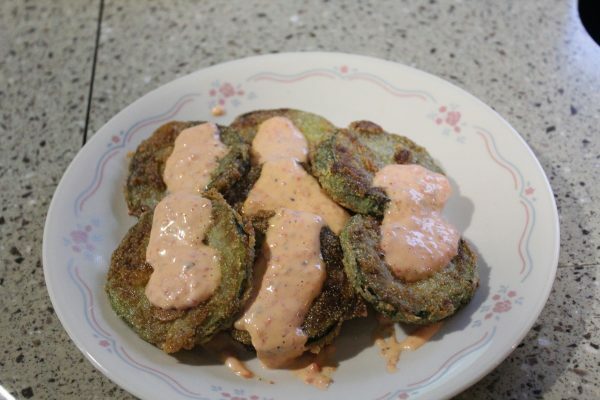 Let it be known that I, who does not do much in the line of frying, just LOVED fried zukes. True confession, I still do! But these days I am ramping them up just a bit. I found that adding Cornmeal to the Flour gives the Zucchini a nice crispy crunch with just a touch of corn flavor. I use a combination of Canola Oil and Butter for an extra flavor burst without risking burning the fried squash. 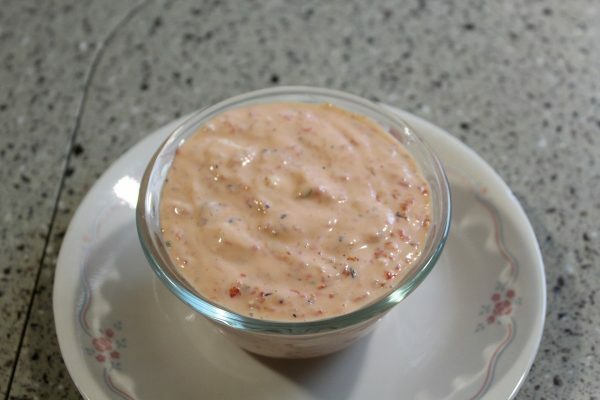 My “cheater” roasted red pepper “aioli” literally came about while standing the motor home scratching my head trying to dream up a quick and easy sauce. It’s not truly an Aioli but that is the catch word these days. I prefer to call it a “creamy” sauce. This is what Sparky said when he tasted the sauce. 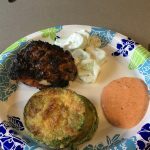 “I have been searching for years to find a recipe that would beat Jonathan P……’s sauce for their Crab Cakes and this is it!” Jonathan P…..’s is a restaurant in Connecticut that Dan frequented for work. So, I’m guessing this sauce would also be wonderful with Crab Cakes! For years I heard this story but I was never interested in trying to copy their recipe. This one was totally off the cuff! 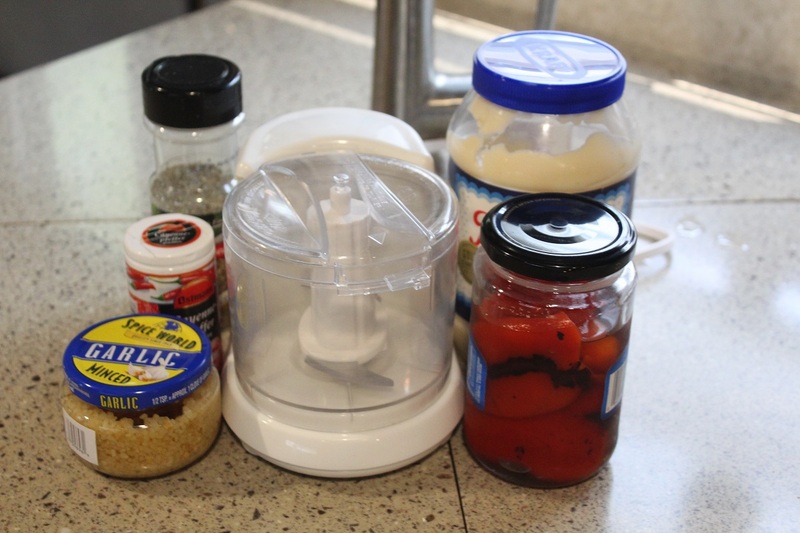 So…here we go and as usual, let’s start with the ingredients. Oh…. and before I get too far ahead of myself, I must remind my friends that we are now living in a rather crowded Motor Home and as you can see from the pictures, I do a lot of cooking outdoors on a Coleman Stove or an electric griddle. And BTW……Paper Plates are now my new best friend! 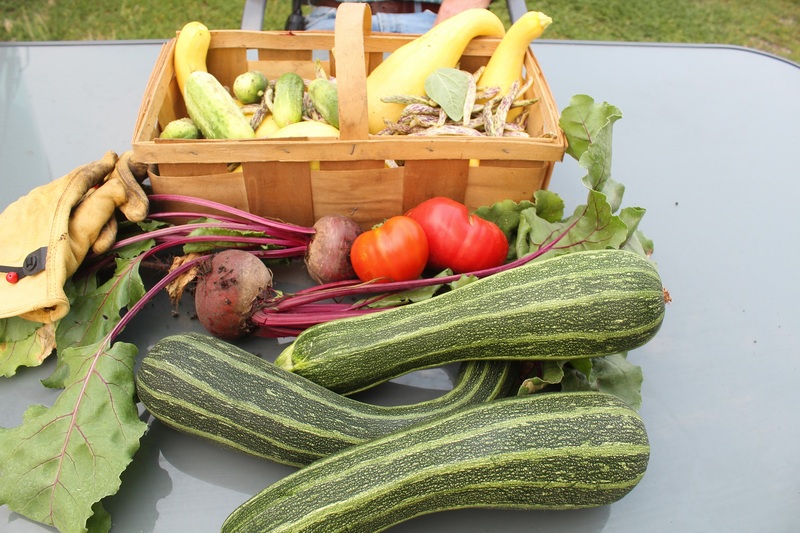 We seem to have a few Zucchini…hahaha! 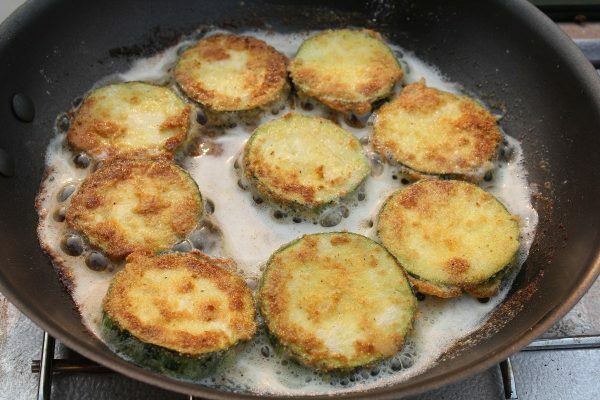 Crispy coating on the outside and tender on the inside, these fried Zucchini are absolutely addictive. 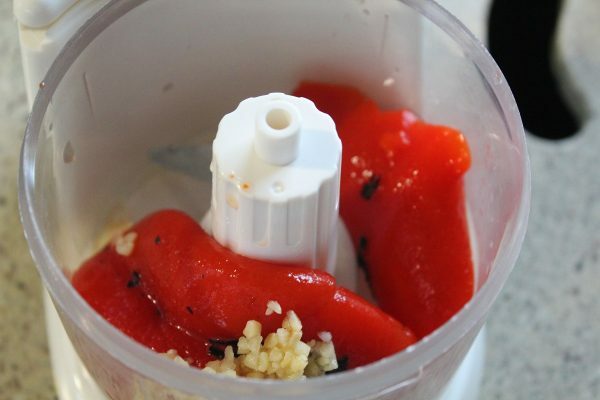 Slathered in this tangy, full of flavor, but mild Roasted Red Pepper Sauce, this one is a winner! 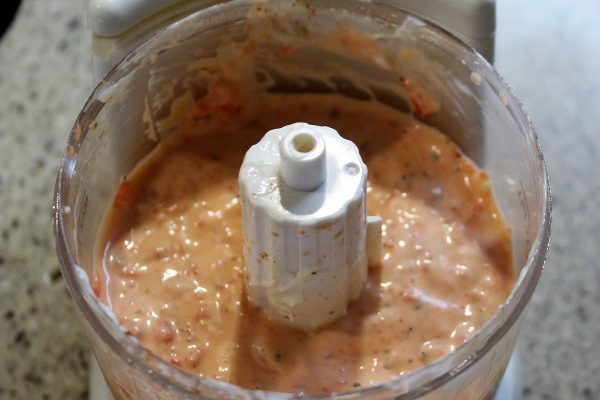 1/2 Cup Whipped Salad Dressing like "Miracle Whip"
Place the Roasted Red Pepper and the minced Garlic in a food processor and Pulse until smooth. I use my mini processor. Add the Whipped Salad Dressing, Italian Seasoning and Cayenne to the food processor and Pulse until well combined. That's it! Transfer to a small bowl and cover with plastic wrap until ready to serve. 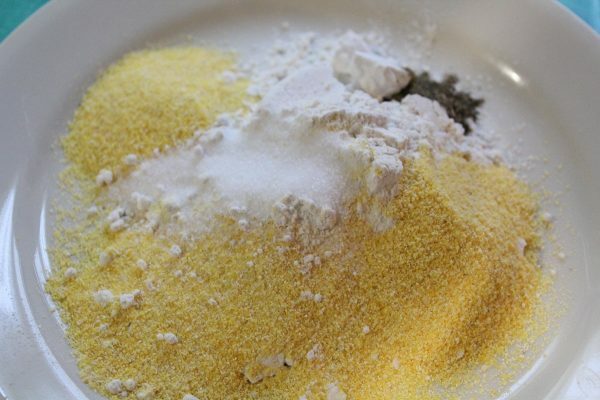 In a shallow plate, combine the AP Flour and the Cornmeal. Stir in the Salt, Pepper and Cayenne until well combined. 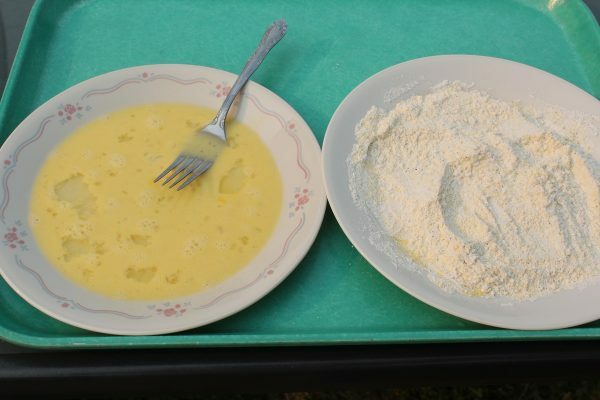 In another shallow plate, mix the egg and water together with a fork until well combined. In a large 12 inch Skillet, melt the Butter and Oil together. While the oil is heating, quickly dip the Zucchini in the Egg and then dredge both sides of the Zucchini in the Flour & Cornmeal mixture. Good grief! Whose Martian Hands are those anyway? 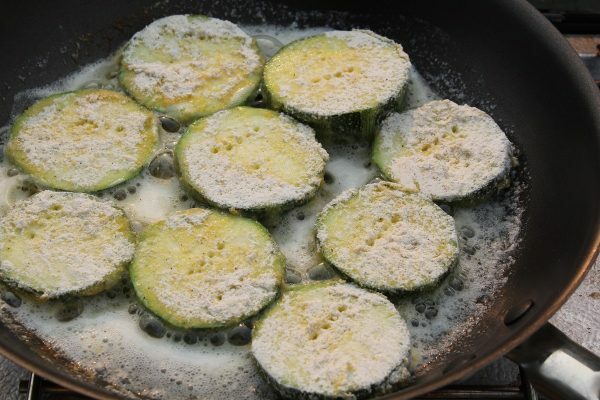 As the Zucchini are coated, add them one by one to the Skillet. 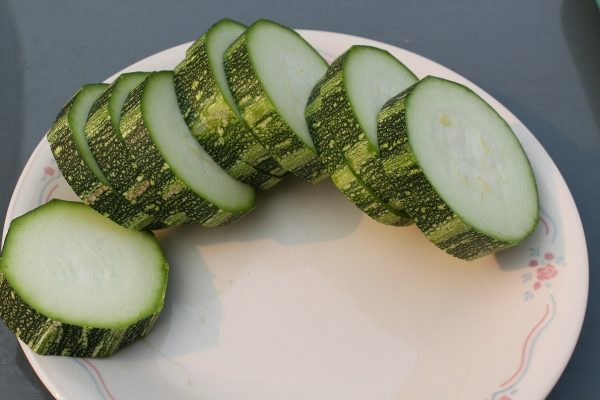 Over medium-low heat cook the Zucchini until golden tan on one side. About 5-6 minutes. 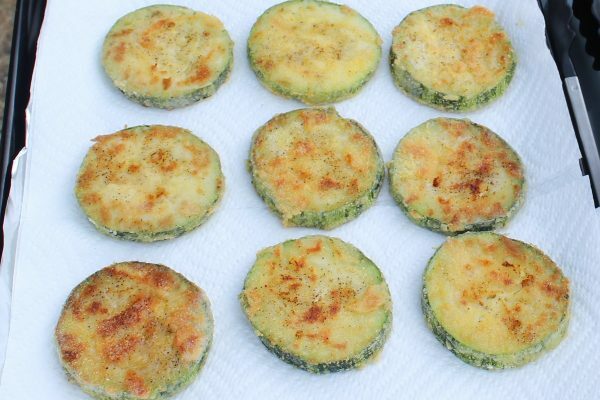 Turn each Zucchini slice over and continue to cook the other side until golden brown. I test with a fork to make sure each golden tan slice is tender in the middle. When done, drain the fried Zucchini on paper towels. Serve immediately with the Sauce either over the top on on the side. As much or as little as you like! Oh my! This is Zucchini heaven! 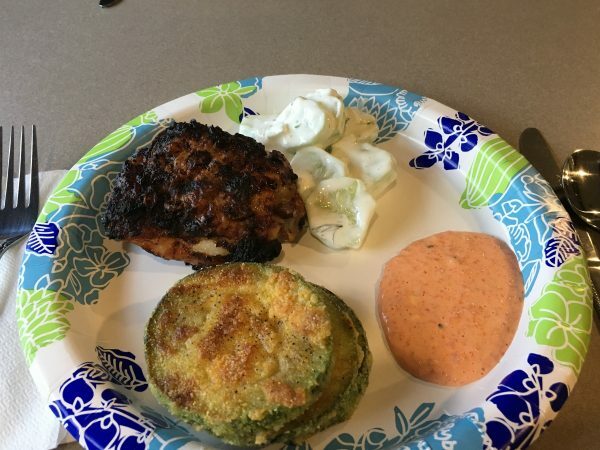 We served our Zucchini with marinated grilled Chicken Thighs and Dan's favorite Cucumbers in Sour Cream. 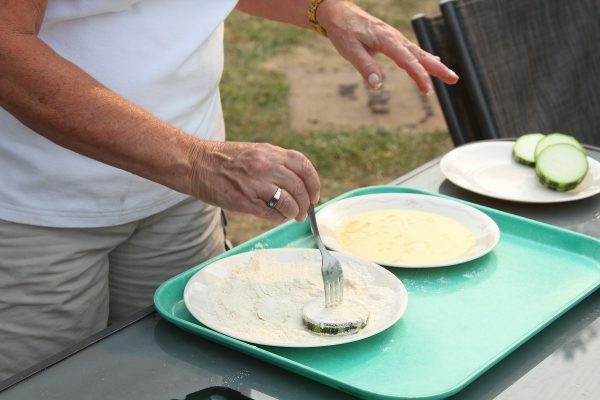 Just the most scrumptious cooked outdoors, garden fresh, delicious meal that just screams summer! Whatever your summer favorite recipes are and I do hope you add this one, I wish you hot summer nights, Lightening Bugs, Shooting Stars and wonderful meals shared with loved ones! Hugs and much love from me, Karen, TJG Journey On! Be sure to follow me on Face book and at my website www.thejourneygirl.com. Leave me a comment. You know I love hearing from you all!